The drawing of the Supreme Court of Tasmania that appears on the cover of Cases and Materials on Sentencing was drawn by the author’s Mother. Interestingly that building was constructed in 1828 and the design resulted in a structure where the dock appeared in the centre of the building. People could be taken downstairs directly from the dock to a tunnel that ran under the Judges Bench to a an area where justice could be metered out in the form of a hanging. The shadow that appears in the images is the current Supreme Court building. 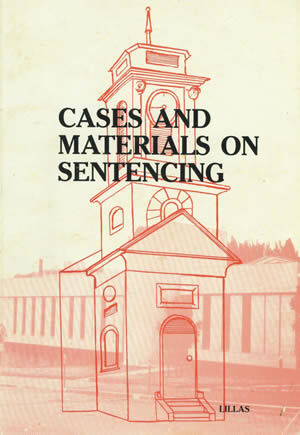 At the time of the drafting of the Cases and Materials on Sentencing the Institute of Criminology was investigating the possibility of drafting just such a reference book. The Chief Justice of Tasmania at the time referred the Institute to Michael Lillas who was granted funding to write the text. The book is an excellent tool to assist practitioners as they navigate the complex maze of decisions which are seminal in interpreting sentencing. The author in identifying and discussing the key pronouncements of the Justices of Tasmania who have, in their time at the bench, balanced the complicated principles that govern sentencing a person after a plea or confection for a crime, manages to craft a valuable resource.